During Thanksgiving week, I traveled from my home in Durham, N.C., to Birmingham, Ala., to spend Thanksgiving with my parents, my girlfriend, Kelley Grogan, and the family of my brother, Brian. 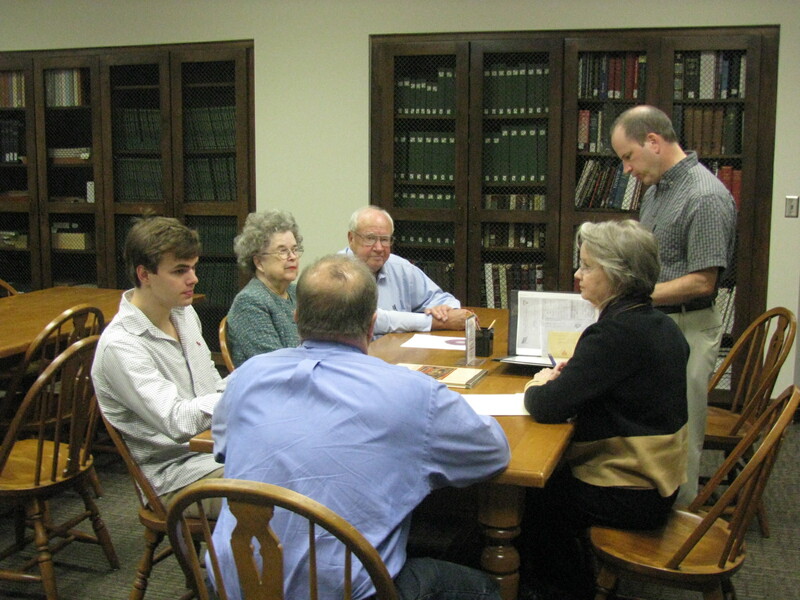 Left to right: Dylan Hughes, Gloria Hughes, Arley Hughes Jr., Tom Hughes, Mary Bess Paluzzi (Associate Dean for Special Collections at the UA Libraries), and Brian Hughes. Our agenda for Tuesday, Nov. 20 included a trip to the Hoole Library at the University of Alabama in Tuscaloosa, where we donated a collection of 64 letters that my grandfather, Arley Hughes Sr. (1891-1969), wrote to his parents, brothers and sisters in Kennedy, Ala., while he served in the U.S. Army in France during World War I. The library plans to make the letters available on their website later. 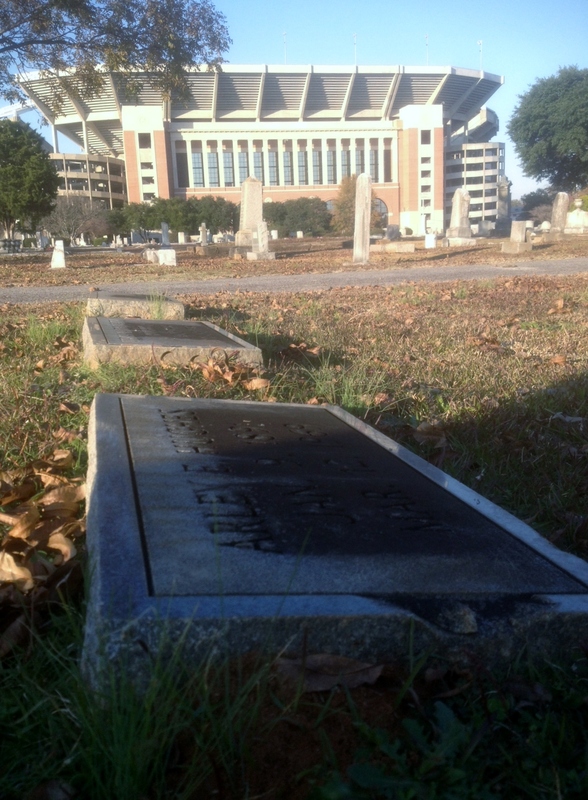 After we concluded our business at the Hoole Library, we visited Arley Sr.’s grave, which is in Evergreen Cemetery, across the street from Bryant-Denny Stadium. He graduated from the UA School of Law in 1917, and then got married, before he was drafted into Army service. After returning home from WWI in 1919, he lived the rest of his life in Tuscaloosa. My father lived the first several years of his life in this house at 828 11th Ave. While in Tusaloosa, we also visited two home sites where my father, Arley “Bill” Hughes Jr., had lived while he was growing up, and a third home site where my mother, Gloria Breland Hughes, had lived. Only one of these homes was still standing. The other two survived a massive tornado that struck Tuscaloosa in April 2011 but have been demolished since then. On Wednesday, Nov. 21, we went on a self-guided tour of several cemeteries where ancestors of ours are buried. First we visited four cemeteries in the rural area where my grandfather grew up, in the countryside outside Kennedy, a small town of a few hundred residents. Then we visited two cemeteries in Reform, Ala., a larger rural town where my grandfather’s wife, Virginia Ellen “Virgie” Doughty (1896-1978), grew up. 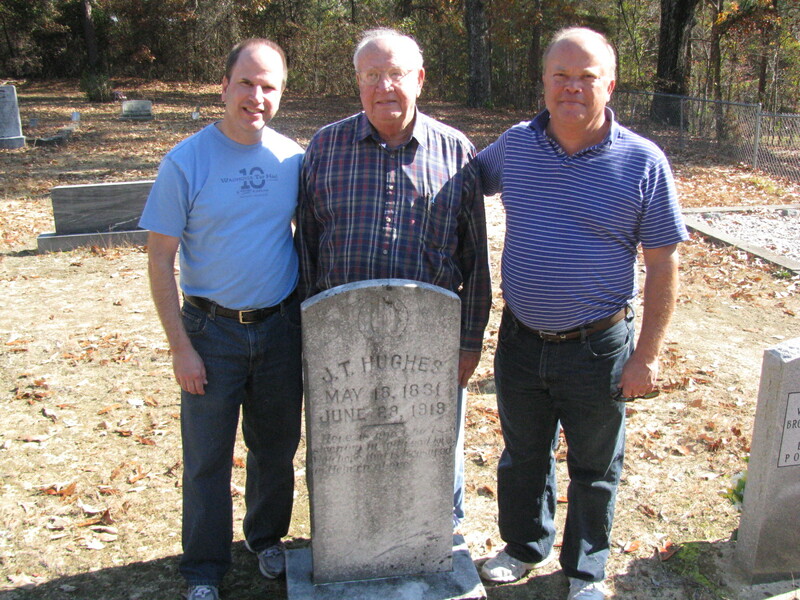 Shown here are me (at left), my father, and my brother, Brian, standing behind the headstone of my 2nd great grandfather, Thomps Hughes. Our first stop was at Ashcraft Corner Memorial Cemetery, next to Ashcraft Corner Baptist Church. For me the highlight of this cemetery was seeing the grave of our first direct line Hughes ancestor to settle in Alabama, James Thompson “Thomps” Hughes (1831-1919). Thomps was the grandson of our earliest known Hughes ancestor, Andrew Hughes (1755-1843), who was born near Lancaster, Penn. 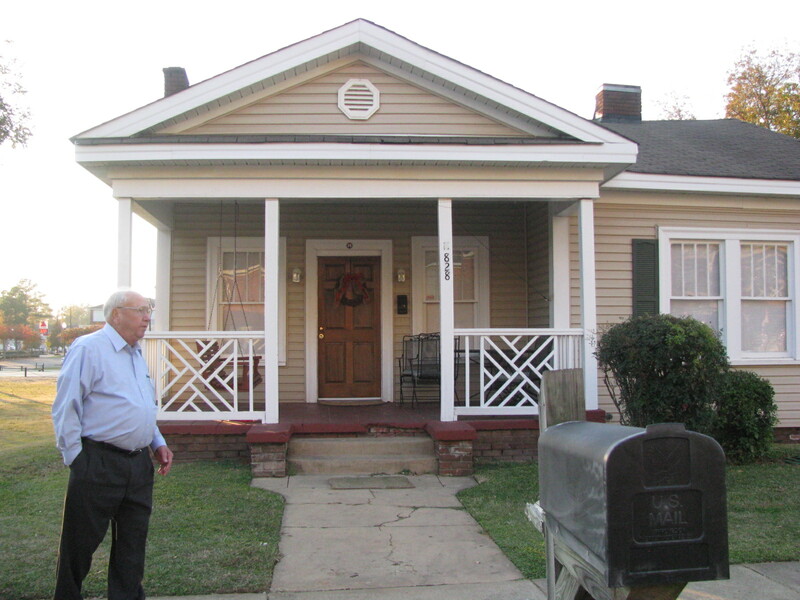 but lived most of his adult life in the old Pendleton District in South Carolina. Next we visited the Wesley Chapel Cemetery, which is on a dirt road (Wesley Chapel Road) and deep in the woods, about 2.5 miles from Ashcraft Corner Memorial. Here we found several graves of ancestors of ours named Wilson, a family that our Hughes line has been associated with since the 1700s. One example of this association: Thomps Hughes’ mother was Margaret “Peggy” Wilson (1801-1848), who married Thomps’ father, Elisha Hughes, in South Carolina in 1819. Hulda Hughes Wilson (1833-1865) was a sister of Thomps Hughes. She married John Wilson (1828-1862), who was her first cousin. We found additional examples of the Hughes-Wilson association at the next cemetery we visited, the Old Wesley Chapel Cemetery (aka, Wilson Cemetery) on Junkins Road, outside Kennedy. There we found the graves of two of Thomps’ sisters, Hulda Hughes Wilson, and Adline Hughes Wilson. Hulda, Adline, Thomps and their younger brother, William M. Hughes, were orphaned after their mother died in 1848 (their father, Elisha Hughes, had disappeared several years before). Custody of the orphans was awarded to their uncle, William M. Wilson, in Anderson, S.C. in June 1848. But by 1850 Thomps, Adline and William were living in Pickens County, Ala., in the home of their older sister, Harriet Hughes (1825-1906), and her first husband, John W. Hamby (1822-1862). Here are a few more examples of the Hughes-Wilson connection. James A. Wilson (1805-1876) is also buried in the cemetery on Junkins Road. 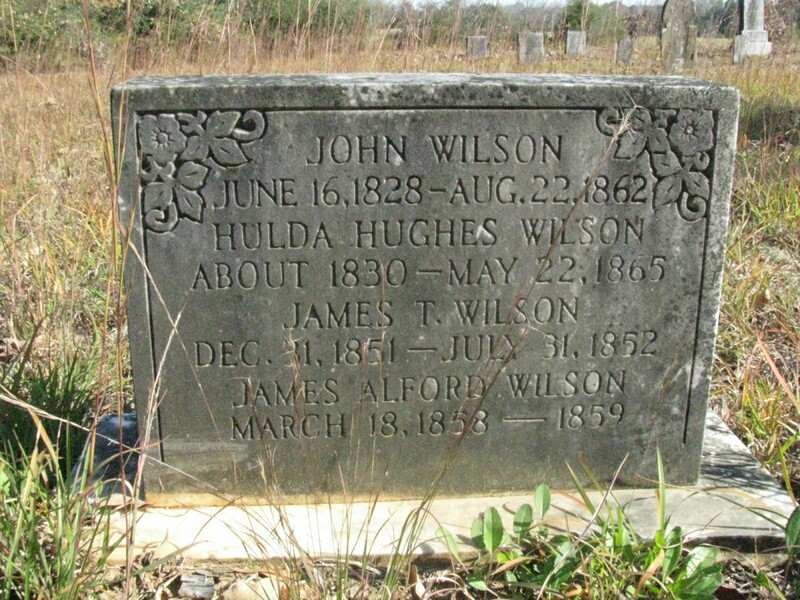 James A. Wilson’s son, John Wilson (1828-1862), was the first cousin and husband of Hulda Hughes Wilson. James A. Wilson also had a daughter named Elizabeth “Eliza” Wilson (1829-1904), who was the grandmother of a fellow named Arley Hughes Sr., who was, you may recall, my grandfather. Another son of James A. Wilson, named James Harvey Wilson (1837-1900), was the first cousin and husband of Adline Hughes Wilson. Our next stop was the Kennedy Express, a gas station and convenience store with a little restaurant inside. While we had lunch there, the clerk told us about a another Wilson Cemetery nearby, which we set off to see after lunch. This cemetery, like the one at New Wesley Chapel, was on a dirt road deep in the woods. 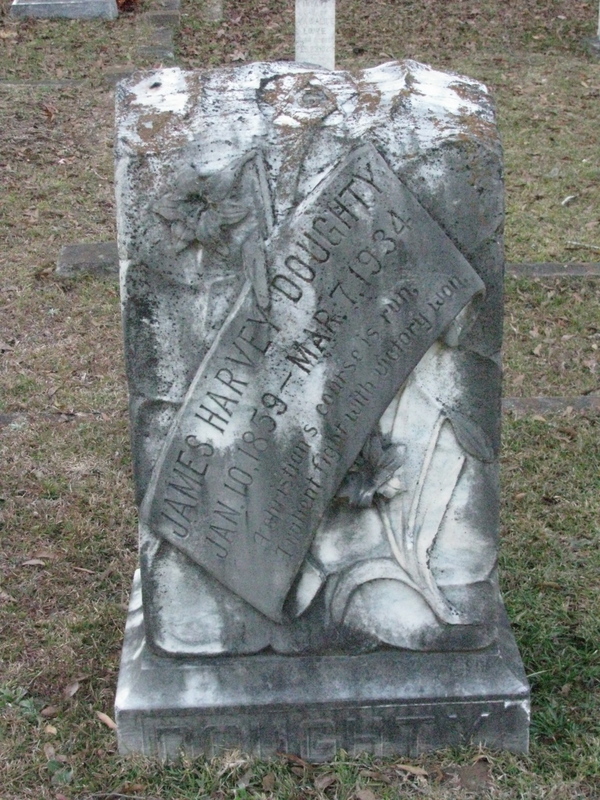 The headstone of James Harvey Doughty, one of my great grandfathers. Then we drove to Reform (pronounced “REE-form”). First we visited Arbor Springs Cemetery, and then we visited Graham Memorial Cemetery, which is close to Pickens County High School. Many of my grandmother’s Doughty relatives are buried at Graham Memorial. Arley Hughes Jr. was a school teacher in Pickens County before he went to law school in Tuscaloosa. In fact, he met his wife, Virgie Doughty (my grandmother) when she sent him a letter inviting him to apply for a teaching job. She wrote the letter on behalf of her father, James Harvey Doughty, who was highly active in the civic life of Pickens County. What did I learn from this trip? It gave me a better understanding than I have ever had before about what life must have been like for my earliest Hughes ancestors in Alabama. They lived on a small farm in an area that even now seems to me very remote, rural and sparsely populated, although it’s only about an hour’s drive from Tuscaloosa. According to my father, the same trip took my grandfather two days by horse and wagon in the early 1900s. The city I grew up in, Mobile, is in the same state, but the world of my childhood there in the 1960s and 70s was in many ways an entirely different planet from the world my grandfather grew up in. This trip taught me, in a very visceral way, that I am not that far removed from my rural Alabama heritage. john holliman here,,,shelbyville, tennessee. father was walter o. hollliman; mother was grace davidson holliman, they are buried at episcopal church cemetary in fayette, alabama.. grandfather moses j. holliman grandmother elilzabeth wilson holliman, buried in clay, alabama. my brother was walter o holliman who was in the holliman family history web site, he is buried in pelham. alabama. would love to come to durham to see the 11foot8 overpass.. Thanks, John! Please do give me a shout if you come to Durham. I’ll be happy to show you that famous overpass! 12-8-12-Enjoyed your writings about Hollimons in Ala. I am William Wayne Hollimon, and live in north Ala. I am a decindent of William Hollimon b 1803 in N.Carlina Moved to Lawrence co in early 1800s His wife was Nancy Bailey b 1815. my great grandfather was Frank Hollimon b.1850 His son was Percy Hollimon b 1874 and I was b 1932. After i retired i have worked on some of these people are connectd to those in Fayette co.Ck out Hollimon,Portwood, Van. William had 9 children and they all went all over the country.would enjoy hearing from you if you have a connecion . Hi! I’m Amy, and we are cousins if you go far enough back. Here is the connection. My mom: Janet Black, her mom: Vera Nell Vice, her dad: Charles Lee Vice, his parents: Simeon Walker Vice and Nancy Adaline Wilson, her parents: John Wilson and Hulda Hughes. I just wanted to thank you for posting all this information. It’s so fascinating and saves me a ton of headaches tracking things down. So, THANK YOU! You’re welcome, Amy! I’m glad to hear it was useful for you.